Bunions are progressive bone deformities of the foot that often cause recurring or chronic inflammation, irritation, and eventually so much pain that surgical correction is required. The surgery to remove a bunion is called a bunionectomy. But as we know well at Cherrywood Foot Care, there are many types of bunionectomies, so each one must be designed to resolve a particular structural change caused by the foot deformity. Head procedures that treat the big toe joint. In a head procedure bunionectomy, the bone is cut just behind the joint, moved into its proper position, and fixed in place with a screw or a pin. These procedures are often used for patients who cannot be immobilized for long periods of time. Base procedures concentrate on the bone near or behind the big toe joint. We conduct different types of base procedures depending on the nature of the deformity. These range from cutting a wedge out of the bone and splitting it so that it can be moved into its proper position; making a semi-circular cut and rotating the bone into its correct position; or fusing the joint. Ligaments inside and outside the toe may also be treated during a base procedure. Choose a surgeon with extensive experience with bunionectomies. Because a deep understanding of the biomechanics of each patient’s foot as well as the intricacies of each surgical option is needed, surgeons with more experience at doing bunionectomies like our skilled staff at Cherrywood Foot Care are better able to help each patient achieve the best outcome. Be realistic in your expectation about what a bunionectomy can accomplish. No physician can truly guarantee that a bunion won’t recur or that a patient will be absolutely pain free forever after. Additionally, because of the complexity of the foot structures impacted by a bunion, patients may be unable to wear normal or slender shoes. Bunion surgery can reduce or eliminate the bone deformity, improve foot alignment and function, and prevent damage to other toes, but it does have its limitations. At Cherrywood Foot Care, we want to be sure you understand all the possibilities before opting for this surgery. Bunion surgery is not a magic bullet. Surgery alone may not be all that is needed to achieve your best outcome. After surgery, many patients experience long healing and recovery times. They often have to spend time in physical therapy. Additionally, they may need a corrective orthotic device on an ongoing basis. Most bunions surgeries today are performed on an outpatient basis at a surgical center or hospital. You should plant to set aside the entire day for the surgery, although you may only be at the facility for a half day. 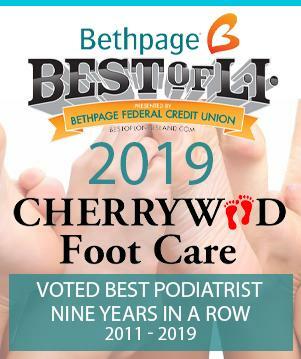 Seeing your Primary Care Physician (PCP) to make sure any other health conditions are stabilized prior to surgery and to document your complete medical history, which can then be given to the highly trained team of foot experts at Cherrywood Foot Care. The night before the surgery, you will not be able to eat or drink anything after midnight. You should also wash your foot the night before and the morning of the procedure to help reduce surrounding bacteria and prevent infection after the surgery. Bunion surgery is usually performed with a local anesthetic administered by an anesthesiologist. This may be combined with sedation medication to put you into “twilight” so that you are fully relaxed. After the surgery, patients are often given a long-acting anesthetic and pain medication, which is why someone else must drive the patient home. Sutures are generally removed about two weeks after the surgery in the doctor’s office. Once the sutures are gone, you can bathe and shower normally, but you will still need to wear a dressing over the wound to keep it clean and prevent infection. By the third or fourth week after the surgery, the swelling generally subsides enough for the patient to begin wearing a wide athletic shoe. It is important to continue daily exercises. If recommended, physical therapy may be initiated at this time. Once the wound has completely closed, you can use lotions to soften the skin in the surgical area.